Yanagawa Hina Festival. Yanagawa town 柳川地区, Fukuoka. 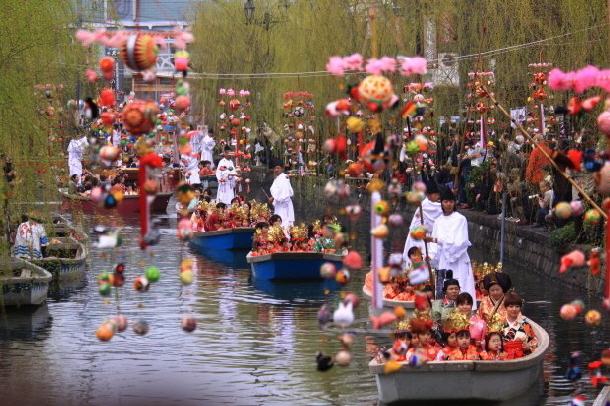 Little girls in bright kimono ride on river boats for their first festival, while the reflections of sagemon (hanging ornaments unique to the Yanagawa region) glimmer on the river. Enjoy this colorful girls’ festival and its Japanese atmosphere. Sagemon are displayed until April 3. Photo and caption courtesy Fukuoka Now, Feb. 21, 2014. Most Japanese people today will tell you that these charming little dolls are meant to celebrate daughters and represent a prayer for their healthy growth and a happy marriage in the future. But this was not always so. Long ago, human-like figurines were utilized to exorcise evil spirits and absorb spiritual pollution (see below). These ritual dolls became more decorative over time and children would sleep with them (letting impurities be drawn out overnight) and the next day the dolls would be cast off into a river or the ocean. The extremely decorative and cute dolls used in modern times only became popular in the Edo period (1600-1867). They are no longer cast away but passed down from generation to generation as heirlooms. Based on Edo-era customs, the maternal grandparents presented the dolls upon the birth of their first grand daughter. Some Japanese today say you must PUT AWAY the dolls immediately after the Doll Festival. If a family fails to do so, it is said, its daughters will be unable to find husbands. 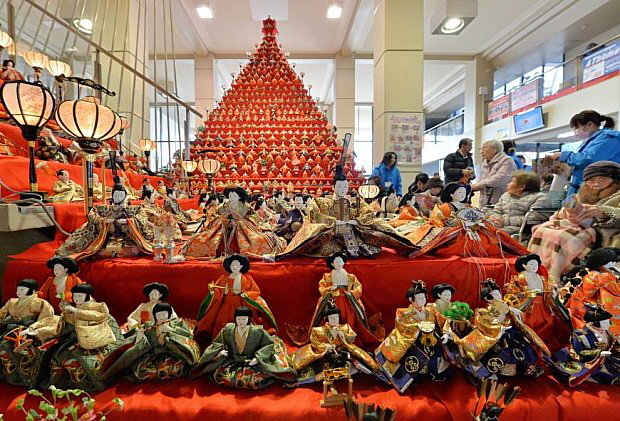 Despite these lingering folk beliefs, the Hina dolls are actually taken out and displayed in February at major department stores, while some families do it during the first week of March and keep them out for weeks thereafter. There seems to be no consensus on exactly when it is best to put them up or take them down. Customs continue to change as well. 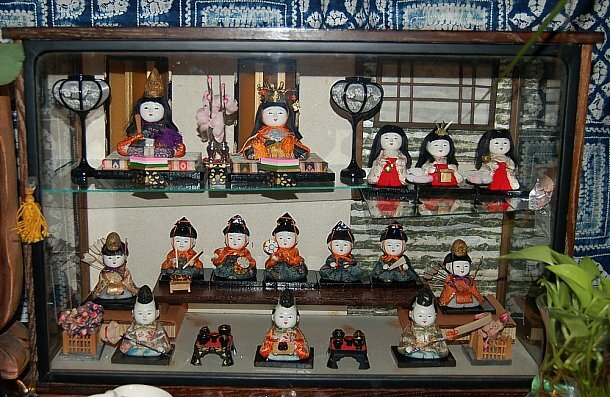 Even families without daughters or no children at all often display dolls, which are typically the wife's own Hina dolls. 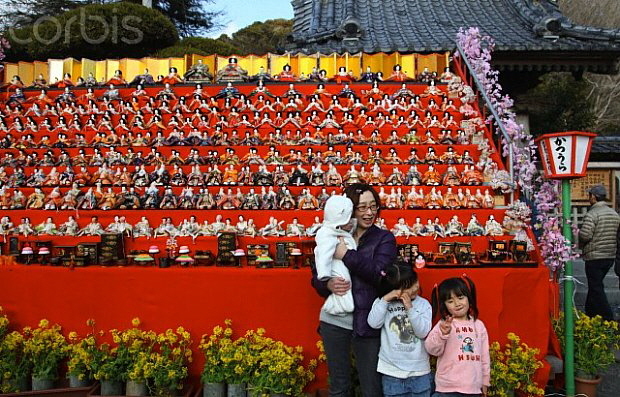 In any case, Japan’s younger generations are not generally worried about old superstitions about the best time to display or remove the dolls. For more details and photos, see Avi Landau’s blog. 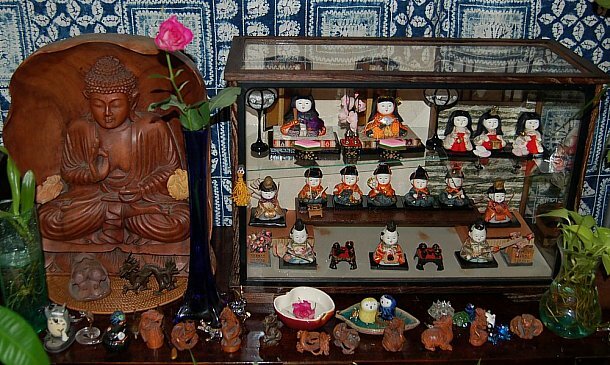 The Hina Matsuri in modern Japan is based on very old Chinese and Japanese traditions. In Japan, the third day of the third month is a day to perform ritual cleansing to exorcise evil spirits. People would rub their bodies with human-shaped figurines made of paper, straw, clay or wood. These were called Katashiro 形代 or Hitogata 人形 and were believed to have the power to absorb all spiritual pollution and bad karma. Other names for figurines are Amagatsu 天児 or Hōko 這子. First month, first day = Kochōhai 小朝拝, New Year Celebration. Third month, third day = Kyokusui no en 曲水の宴, Drinking Around a Rolling Stream. Today known as the Doll Festival (Hina matsuri 雛祭) or Girls’ Festival 女子の節句. Fifth month, fifth day = Tango no sekku 端午の節句 or Boys' Festival. Today it is a festival for all children of both sexes. Seventh month, seventh day = Kikkōden 乞功奠 or Tanabata 七夕 Festival. Ninth month, ninth day = Chōyō no en 重陽の宴 or Feast of Chrysanthemums. Jōshi no Sekku 上巳の節句 (original name for the Doll Festival in Japan). It literally means SEASONAL FESITVAL OF THE SNAKE, for the first day of the third month is the day of the snake. In China and Japan's old lunar calendar, this day occurred around March one (April one in today's solar calendar) and was thus also called Momo no Sekku 桃の節句 (literally Peach Blossoms Festival), for the peach trees are usually in full bloom at this time. On this day, people would perform symbolic ablutions or ritual cleansing to exorcise bad spirits. Such cleansing was performed by a pond or a river, with water and rice wine being used to cleanse the mouth, hands and feet. Kyokusui no en 曲水の宴. In later centuries, the festival day was changed to the third day of the third month in Japan, and known as Kyokusui no En, literally "Drinking Around a Rolling Stream." Today this festival is know as the Hina Matsuri (Doll Festival for Girls, held on March three every year). The story goes: Chinese aristocrats used to hold poetry parties by artificial garden streams. A bowl would be floated down the stream with a cup of wine. Participants sitting at various points downstream would have to compose and recite a poem before the bowl reached them. This was an elegant and cultured festival game, played under the peach blossoms which bloomed in March (lunar calendar) or April (solar calendar). This custom was adopted by the aristocracts and noblity of Japan, probably in the Nara Period ( 710-794), when everything Chinese was the rage, and certainly by sometime in the Heian Period ( 794-1185). During the festival, they used tiny dolls figurines called Katashiro 形代 or Hitogata 人形, which they cast off into rivers or ponds, sending away impurities and bad luck and bad spirits. Hinamatsuri 雛祭 or Doll Festival, March three every year. By the 16th or 17ｔh century, the above traditions filtered down to the common people, who changed them into today's charming Doll Festival. This was done by word play. For example, the original festival name was Jōshi no Sekku (snake day), but the word for snake (Jōshi) sounds like the word for girl (Joshi 女子), so it became a day devoted to girls. The ritual dolls themselves then came to be more decorative, dressed in kimono etc., and children would sleep with them the night before they were cast off (letting impurities be drawn out overnight). From the literature of the 10th century, we also know that there were dolls for play (not for ritual use), which were called HIINA (at that time meaning “little things”), and were a male-female pair. It is possible that these were based on, or derived from the HITOGATA used for ritual purposes. It is the name of these play dolls, in shortened form HINA, which came to be used for the Peach Festival dolls (and thus we can see a blending of the two streams, the ritual dolls and the play dolls).